I haven’t done a tart for dinner in a while, so between the beautiful dandelion greens I picked up from Simmons Farm at last Saturday’s farmers’ market, and Clotilde’s recent post about her easy olive oil tart crust, our meatless Monday dinner was a no-brainer. Mike made the crust while I was on the train home, and he reports that it was just as easy as advertised. He blind-baked it and set it aside, and when I got home I assembled the filling. 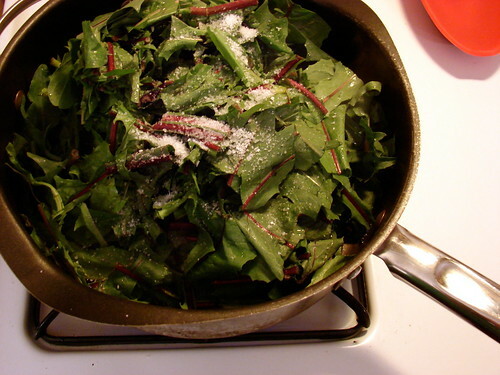 While I wilted two bunches of dandelion greens in a hot pan with a bit of olive oil and salt, I whisked together about a cup of Narragansett Creamery ricotta, two Zephyr Farm eggs, a pinch of salt, and a half cup of grated Pecorino Romano. After the greens had cooked down, I gently squeezed out the excess liquid and incorporated them into the cheese and egg mixture. 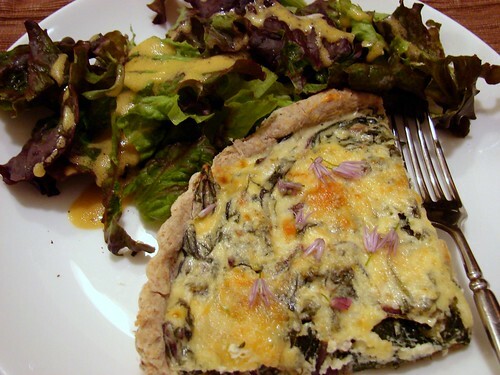 I added in a handful of chopped chive blossoms from the garden to add little bursts of color and oniony flavor, then spread the mixture into the tart crust, finishing it with another layer of grated cheese and a drizzle of olive oil. 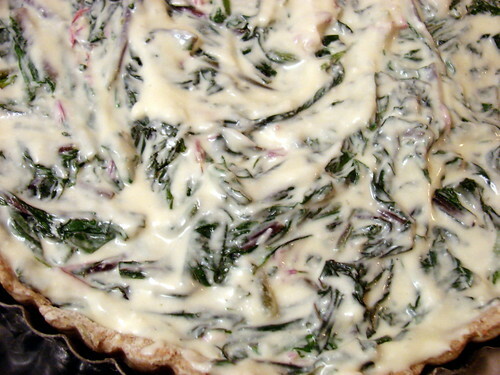 The tart went into a 400 degree oven for another 25 minutes or so, until the filling was set and the top golden, and I served wedges of it with a salad of butter lettuce and a mustard vinaigrette – a simple and delicious dinner that would make a great brunch or lunch as well. I just adore the beautiful simplicity of this dish. So lovely! Looking at a meal like that does as much for my soul as my stomach! Between your quality photographs to your detailed descriptions, you really do add glamour to going meatless on Mondays (or everyday!). Your pointed effort to incorporate both greens and beans is crucial, in order to compensate for the loss or protein when we remove meat from our diet; this concept of ensuring that meatless is also nutritious is one that the nonprofit campaign Meatless Monday encourages. 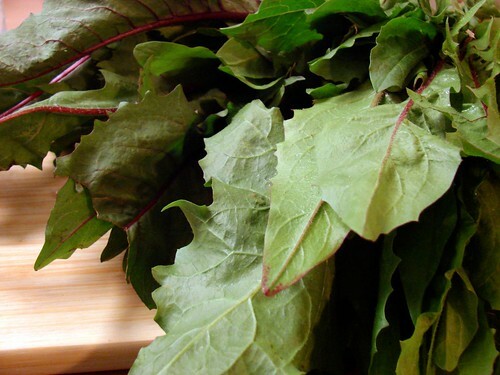 And as a project of Johns Hopkins Bloomberg School of Public Health, the Meatless Monday website is rich with nutrition facts as well as cooking tips and a myriad of meatless recipes. You may enjoy some of the more festive recipes, like the Jamaican Jerk Tofu (http://www.meatlessmonday.com/site/PageServer?pagename=recipe_dinner_070604) or the Morrocan Pumpkin Stew (http://www.meatlessmonday.com/site/PageServer?pagename=recipe_dinner_071029). Thanks, everyone! 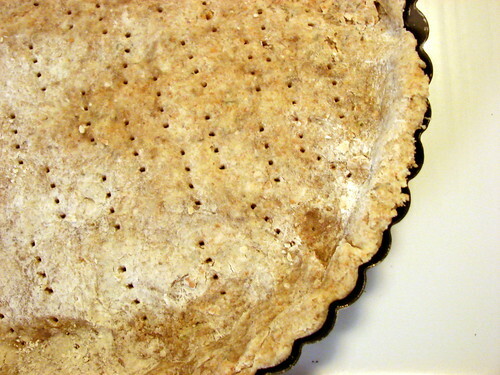 The tart crust recipe was really the star, and I bet it would work well with all sorts of wonderful fillings. I expect it will get a lot of play in our kitchen in the coming months.